If you want fruit-forward, ripe, red wine for a good price, look no further than Puglia. Some of the best values in Italian wine come from this sunny, dry region. Most Puglia wine is red, full-bodied and will pair well with a wide variety of foods. 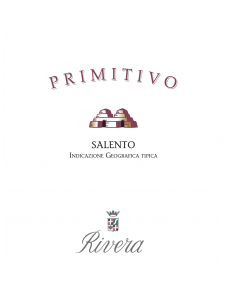 A classic wine from Salento, Primitivo is a dark-skinned grape variety which takes it name from its early maturation (‘early’ is ‘prima’ in Italian) and tends to develop high sugar and alcohol content so the resulting wines are big, luscious and full of dark fruit like fresh figs, blueberries and baked blackberries. Medium-bodied and complex on the palate, remarkably supple. A very versatile wine that will pair well with pastas, soups and meats. 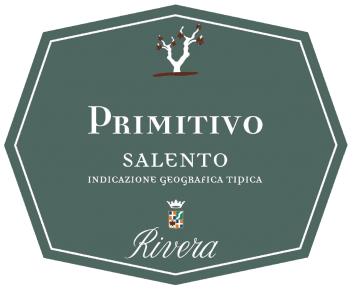 Primitivo is an attractive entry-level from Rivera, one of the top estates in Puglia, which excels with red wines that are also exceedingly fairly priced. Aged for 9 months in glass-lined cement vats. DNA analysis proved that Primitivo is actually the same variety as Zinfandel, America’s beloved grape. If stored properly, it will drink well for at least 3-4 years. Starting with the 2016 vintage, Rivera Primitivo features a new, sleek packaging. ‘Salento gobelet’ style. 50-80 mt above sea level. Average yield is 80-90 quintals per hectare. Grapes are harvested during the last week in August and macerated at 25°C for 7-8 days in stainless steel vats with frequent pump-overs.